The Gold Line will be running all night on New Year’s Eve for those who want to view the floats tonight as they line up on Orange Grove Boulevard or those headed to the parade or game on Tuesday. Four stations in Pasadena (Del Mar, Memorial Park, Lake and Allen) are within a five- to 10-minute walk of the parade route along Colorado Boulevard. Follow the crowds — it’s kind of hard to miss! As someone who lives very close to the parade route, I’ll say the same thing to motorists that I say every year: driving to Pasadena and parking in residential neighborhoods near the parade route is hypothetically possible — especially for people who arrive before 6 a.m. The problem comes each year after the parade when all the parade-goers gets stuck in long, long, long traffic jams complicated by the fact that a lot of people are trying to drive into Pasadena at the same time to attend the Rose Bowl game. You’ve been warned, people! •From East LA-Atlantic or Downtown LA-Union Station, board the Gold Line toward Pasadena-Sierra Madre Villa, then exit at any of the following stations which are within short walking distance of the parade route: Del Mar, Memorial Park, Lake and Allen. •From Sierra Madre Villa, customers should board any train, then exit at any of the following stations which are within short walking distance of the parade route: Allen, Lake, Memorial Park and Del Mar. •Customers are encouraged to purchase an ALL DAY PASS before beginning their trip to avoid long return lines to purchase tickets. 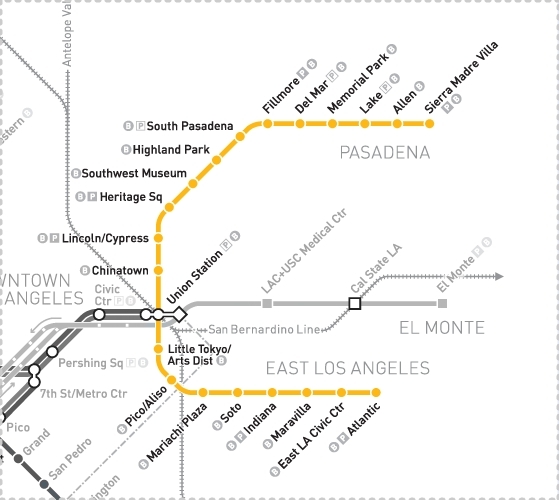 •Longer and more frequent trains will operate between Downtown LA-Union Station & Pasadena-Sierra Madre Villa. Please use the entire boarding platform when boarding. •Please click here for more information on Metro’s schedule between December 31 and January 1, including OVERNIGHT 24-hour rail service from December 31 into January 1. •All customers traveling to the Rose Bowl Game should exit the Gold Line train at Memorial Park. From East LA-Atlantic or Downtown LA-Union Station, board the Gold Line towards Pasadena-Sierra Madre Villa, then exit at Memorial Park. •From Sierra Madre Villa, customers should board any train, then exit at Memorial Park. In anticipation of higher ridership, longer and more frequent trains will operate between Downtown LA-Union Station & Pasadena-Sierra Madre Villa. Use the entire boarding platform when boarding. •After exiting at Memorial Park, walk 3 blocks west on Holly Street (turn right upon exiting station), past Fair Oaks Avenue to the free Rose Bowl shuttle that leaves from the west side of the Parsons parking lot along Pasadena Avenue. Again, it’s hard to miss. Shuttles run continuously from 10 a.m. until about two hours after the end of the game. This shuttle is NOT operated by Metro. Shuttle info is provided as a courtesy and subject to change without notice. For those that are coming to the Parade tonight, won’t Day Passes expire before the return trip??? NYC and Oslo are 2 places that I know of that have true 24 hour day passes. Oslo, when you buy the paper ticket, you then stamp it in the time clock, so you know when it expires. That’s one gripe I have with Metro. Say you leave Downtown LA at 11:00 PM. You can buy a day pass at 11:00 PM, but it’s only good for an hour until midnight. It doesn’t carry over past midnight to 11:00 PM the next for a full 24 hours of usage. This, is exactly another reason why we need to just end paper passes and move strictly to TAP. Enough with this “oh how about transfers to [insert some other lame agency]” problem. No one cares. Just move to TAP whether or not others use them or not. If they complain, it’s their problem and their fault for not moving to TAP. But doesn’t the Day pass expire at 3am? It does not matter if it is on a TAP or not.